From the guitar players’ point of view ukulele chords are best seen as constructed on the top four strings of the guitar. 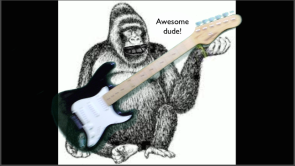 Even if you are not a guitar player who is making a switch or adding a new instrument to your arsenal the information here can still be of great use to you I am sure of it. ...or go search anywhere on the Internet and you can find endless pages of chord boxes to satisfy even an advanced player. The dichotomy being that an advanced enough musician doesn’t really need chord diagrams because she or he can write them! Basically the Ukulele is tuned to a C Major 6 chord or C6 for short. The note order is pretty consistent. This pattern will almost invariably follow 5th Root 3rd 6th. What does vary is the implied chord root itself and the register of the pitches. 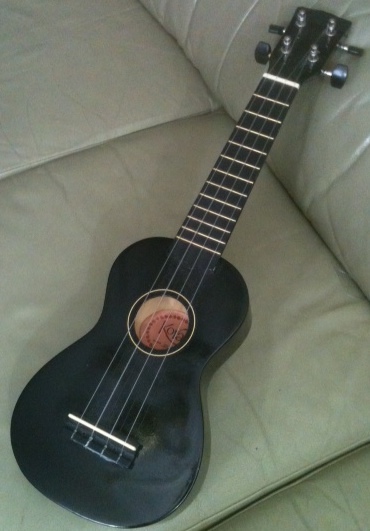 So if you are playing a Baritone Ukulele you’re really just playing a little guitar with out any Low E and A strings! This shouldn’t really present any major challenge if you’ve been playing guitar for a reasonable period of time. If you are playing any other ukulele or tuning thereof read on. Because of the tuning, ukulele chord calculating and naming from a guitarist's standpoint requires some transposition. There are several ways of approaching this task. Of the several possibilities to cope with this issue your own brain and learning mechanisms will dictate which is the easiest for you. There is no “right” answer for this. The idea is that you don’t really transpose at all (in your mind). This is a type of scordatura. A good way of communicating with a group of musicians who play transposing instruments is to name the chord harmony with the Roman numeral harmonic analysis. “Go back to the IV chord and start from there”. Remember music theory if nothing more is all about the language and labeling of patterns so that we can communicate. So if you can get your head around the pattern you’re working in just label your chords by function (i.e. is it the I chord? IV chord? V chord?). Try to memorise the chord sequence and label it with numbers. (this is often called the Nashville Numbering System or NNS). A very common chord progression for many popular songs is the I V VI IV progression. Just look at Let It Be by the Beatles. NB: You may see VI- or vi or vi- all three mean "six minor chord". This holds true for any Roman numeral. Capital V's and I's for example are assumed to be of major quality. Where as lower case or caps followed by a minus sign relay minor quality (v or V- and i or I-). Finally (although I am sure there are other methods) we have the intervallic principle. This requires a bit of mental agility. If you get your mnemonics going right it is less taxing than it first looks. If you want a C you play a G "Wanting = go up a 5th"
If you see a D you hear a G "Seeing = think up a 4th"
Pick a key and practice strumming four beats of each chord of the I IV V progression. Keep repeating slowly and evenly in time. Try to get to the point where you can get through in the order of I IV V without "glitching" or breaking time. Once you are confident that your tone is good and your notes are all ringing try a different order like say I V IV I. Then maybe I IV I V. Keep going until any random chord change can happen using any of the I IV V chords you are working in. Remember to learn the names and function of each chord you're playing (i.e. is it the C I ? F IV ? or G V?). Try different amounts of beats/strums per chord as well. Next time we will look at expanding our ukulele chord vocabulary and tackle some songs together! Happy playing!